The taxi driver into town was playing a garage compilation cd, skipping songs every 30 seconds, enjoying the ride and chatting away in a Bradford accent that Paul found somewhat difficult to understand. I however have integrated fully. No queue to get in at 11.00pm (I'm getting obsessed). Hopefully this means fewer pill poppers tonight as live acts seem to repel the raver contingent and attract the dread. 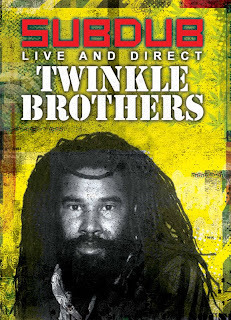 The main room was set up with stacks either side of the stage and one at the other end of the hall, which meant that the Twinkle Brothers were going to play through Iration's system- a blessing, as we later found out. 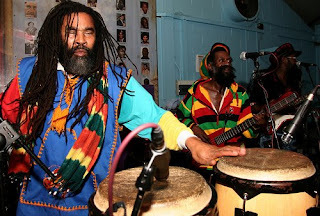 As is tradition when visiting (live) artists play, Mark was dropping a rootical selection of late '70s JA stuff (Black Uhuru etc) with the odd contemporary digi-roots tune added for good measure- warming up the crowd nicely. We popped into the backroom where Sizzla and Dizzee Rascal vocals were being thrown over heavy dubstep. Stayed longer than we meant, because a) it sounded good- vex'd could well have been playing as it turned very evil-and b) I queued for beers for about 1/2 an hour. I also found out that cans in the back room were 30p more than in the main room about 5 metres away. dubstep tax. cheaper for the righteous. Makes up for walking right in when we arrived. Suitably refreshed we searched out the Twinkles. The band were already playing on stage- tight and heavy, sound system rather than 'live' sound- but no Norman Grant. First song finished and on he bounds- nice cape. For the next couple of hours he and the band put on a amazing show- professional, tight with the full range of pull ups, stop-starts, extended outros etc with the occasional bit of live dubbing, as song went into extended version. the whole place was jumping. They encored and then it was time for Iration again, starting with the Cool Ruler's 'Rumours' going into version and dub (featuring a live rendition of Welton Irie's 'Army Life' lyrics), the Barrington Levy and Cultural Roots tunes that Revolutionary Sounds (re)released last year (listen to my last mix to hear them) and a redo of 'Lot Of Signs', which I've heard at all the last few Iration dances. 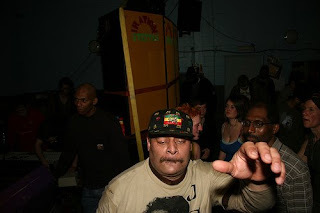 Then some Twinkle Brothers dubplates (upcoming on Sip A Cup) before year 3000 bizness. A guy who'd been leaning on the barriers by the control tower touches the mike- the sweetest voice! Mark and crew grin like cheshire cats. 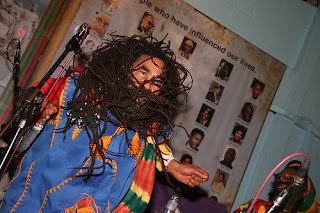 A Rasta does stretches and lunges, warming up for the ensuing steppers session. Cameras flash. Smiles all round again. All night. Clock said 4.00am, so we reluctantly headed off in order to get (an unbelievably clueless) taxi, ears well and truly ringing. more photos here c/o kudo design.